Not my usual cup of tea. Let’s start with literal, I love tea, and I love all kinds of tea. Mostly black teas and flavoured black teas, so when the chai phenomenon hit, I was right there in line. I’ve even been in line for “Dirty Chai,” which is chai latte with a shot of espresso thrown in. WHOOOO! RUSH!!! Sugar and spice and caffeine, oh my! Had a different style in New Zealand in August. It tasted like they made the latte, then put a chai syrup in, and it definitely had to be their own recipe. Heavy on the ginger, at the time I wasn’t much a ginger fan, but it was still very tasty, and if you visit Wanaka, you should drop in and try something at Federal Diner. Now that I’m suddenly into foods with fresh ginger I need to go back and try it again. 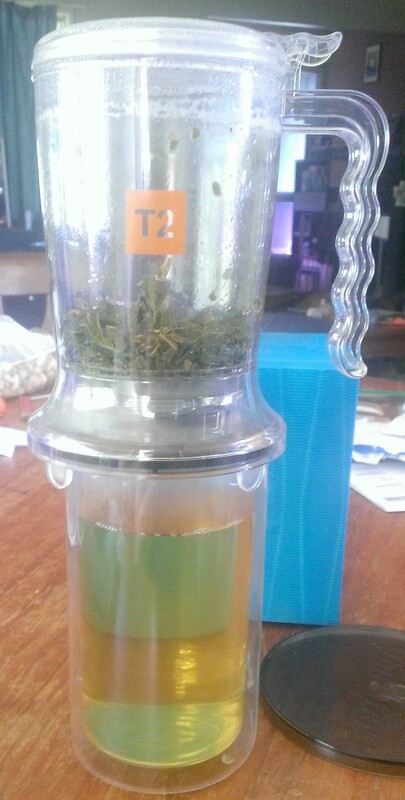 In recent times I’ve been dabbling in flavoured green tea. 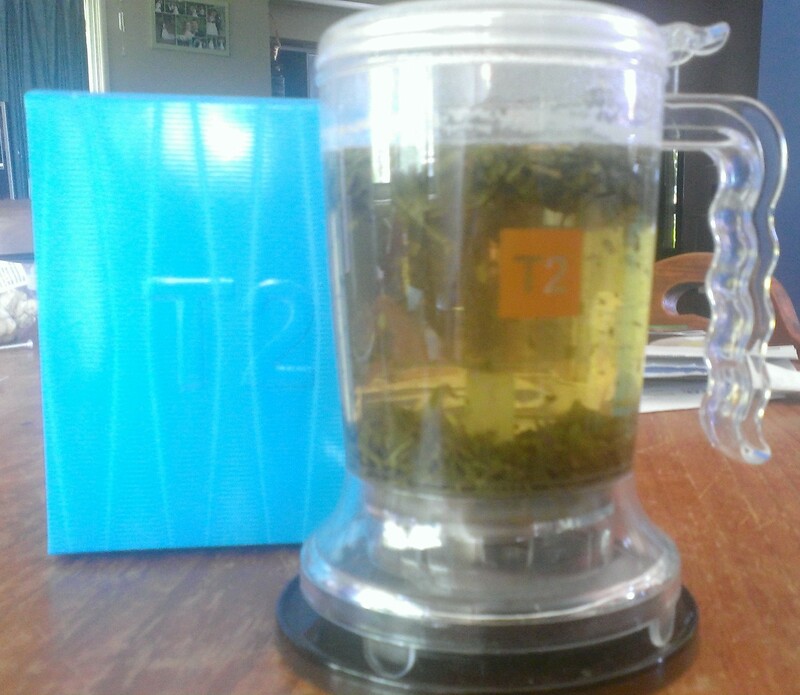 A month or so ago I bought myself a treat in the form of a groovy tea device and a box of assorted flavoured teas from T2. Black, green, herbal and fruity. I am ploughing through them. This morning I had the Gorgeous Geisha, which is green tea with strawberry and yoghurt flavours, sweet green tea agrees with me, and I’ve been cutting back on the caffeine, so a lessened caffeine hit and keeping the joy of tea is a wonderful thing. 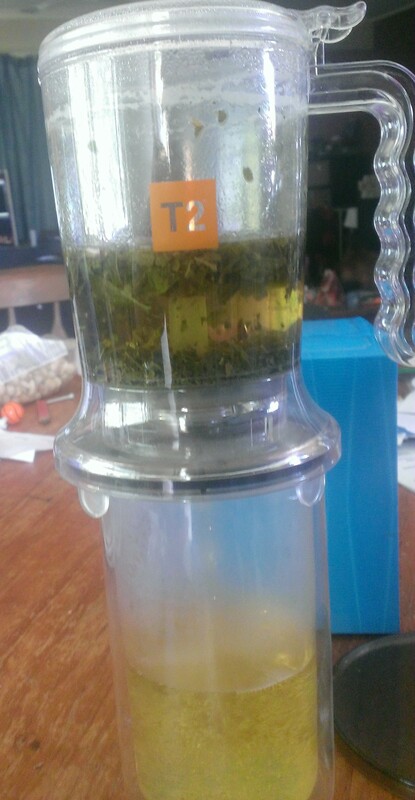 So yeah, you can see how it works, the tea filter is in the bottom and there’s a release mechanism that when you sit it on a tea cup (or in my case insulated glass because I make tea then forget about it for half an hour….) it filters the tea into your cup. It was in the kit and caboodle gift set I think… came with some english breakfast tea and a herbal sleepy tea that I’m a fan of anyway, so it was a great pack for me. Figurative: One of my girlfriends suggested a new TV show for me to get into, and I’ve been having a binge. Ok, more like addiction… I watched 4 seasons in under a month… Pretty Little Liars has become quite the guilty pleasure for me. I put it on if I have time before work, as soon as I get in from work. Cup of tea, curl up on the couch, let the brain cells turn to mush watching angsty teens and the perils of their lives and how spinning lies is slowly destroying them all. I love it! I’m primarily a sci-fi/fantasy person, so getting into something soapy is a bit different for me. As yet, I still can’t put my finger on what I’m enjoying so much about it. The girls are all very good actors. The fashions are amazing, and while I have a keen interest I’m not a fashion obsessed person. The plot has a lot of sharp turns… I do like twisty plots, and you don’t get too many useful clues if you’re trying to work things out yourself, and I’m pretty sure that’s on purpose. Without giving too much away, the girls are investigating the disappearance of their friend. Within all the suspense, they’re keeping secrets from each other, their parents, their boyfriends and every now and then, an episode comes along that punches you right in the feels. Never been into that kind of show, but I find myself actually pouting at the TV. One of my new work friends (who’s young enough to know what’s cool,) helped me recently pinpoint what’s probably the real reason I’ve become so obsessed with the show. 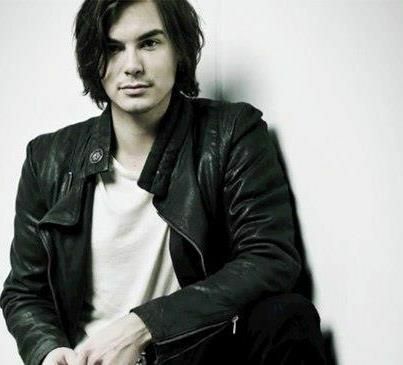 Aside from the young ladies who are very talented there’s a young man who’s very very….. talented. Caleb Rivers: Cougar bait. From Pretty Little Liars Pintrest boards. Can’t wait to get my hands on season 5 when it comes out in Australia! And now that I’ve run out of Liars, what ever shall I binge on? Weighing in on the Thermomix thing. So, I’ve had a Thermomix in my possession for a whole week now, and as little spare time as I generally have, I’ve managed to cook up a few storms. On day one I made a batch of vegetable stock, a bacon and capsicum risotto for husband’s lunch. The next morning I steamed an omelette and a tomato onion filling for it, then later that night, homemade pizza dough….. The next day was Monday, I had an insane Monday, double whammy work-wise, so food was sushi, and things you can rip-open and eat over the sink…. Tuesday I had a dinner party, one of my girlfriends usually lives on the other end of the planet and Tuesday was the only night I could snag her! We had sun-dried tomato dip, Steamed Chicken and veggies with mash potato and cheese sauce, then I finished it off with a Chocolate mousse. All of that done in the Thermomix. Later in the week I made a batch of mushroom sauce that lasted for a few more meals, I used it for a filler in a flat bread melty thing. I also used the leftover sun-dried tomato dip for a pizza base sauce and also the flat bread melty thingy I’m into right now and was really happy with the results. Custard happened as well and it was awesome. Now here’s another funny thing, my husband had a day off and made dinner, which had more Thermo-mash and a batch of scones, which just now I found the recipe open on my tablet, so while I was at work my husband baked, make dinner and navigated the thermomix recipe community! It’s MAN FRIENDLY!!! Stay tuned for more Thermomix adventures, of which I’m sure there will be many!